Toronto and even both Calgary and Seattle trump Vancouver when it comes to the number of skyscrapers each city is home to, according to a new ranking of global cities. There are 57 skyscrapers in Vancouver, putting the city at the 68th spot — tied with Doha, Qatar, just behind Kunming, China, and just ahead of Philadelphia. Contrast this with Toronto’s ranking of ninth with 292 skyscrapers, San Francisco’s ranking of 51st with 81 skyscrapers, Calgary’s ranking of 63rd with 66 skyscrapers, Seattle’s ranking of 66th with 60 skyscrapers, and Montreal’s ranking of 68th with 44 skyscrapers. This ranking was recently compiled by CEOWORLD magazine, which reviewed national and international media reports and additional information about skyscrapers from Emporis — a renowned online database detailing buildings around the world. While Vancouver may visually be known for having a dense downtown comprised of a towering concrete jungle, most of the buildings fall quite short of the skyscraper standard defined by Emporis. To qualify as a skyscraper, a building must have a height of at least 100 metres (328) ft; buildings with heights of between 35 metres (115 ft) and 100 metres are highrises, and anything below 35 metres is a low-rise. 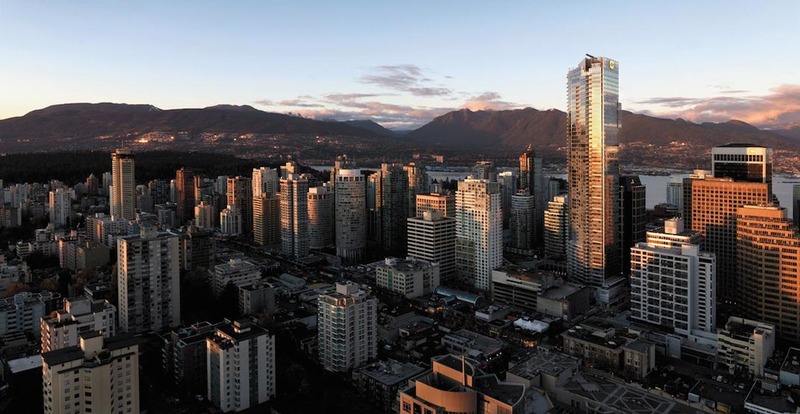 Of course, building heights within the City of Vancouver are largely restricted to protect views of the mountains that backdrop the downtown skyline, which has an illusion of appearing to be larger than it really is because the large cluster of short towers are generally slim. To illustrate this, Daily Hive dug a bit deeper beyond the overall city rankings. 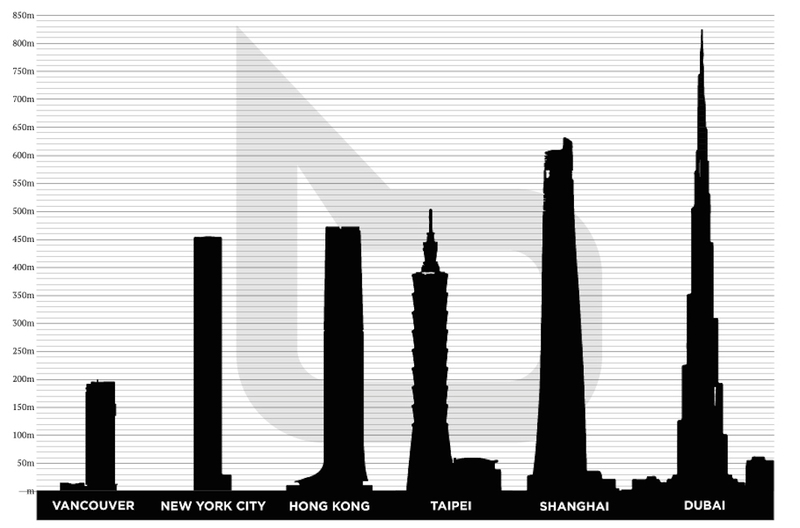 Buildings that seem tall in Vancouver would be considered dwarfs in the world’s skyscraper capitals; for instance, Vancouver’s tallest skyscraper, Living Shangri-La, with a height of 201.2 metres (660 ft), would be the 62nd tallest building in Hong Kong and the 74th tallest in New York City. Living Shangri-La would also be 24th tallest in Toronto and the sixth tallest in both Calgary and Seattle. 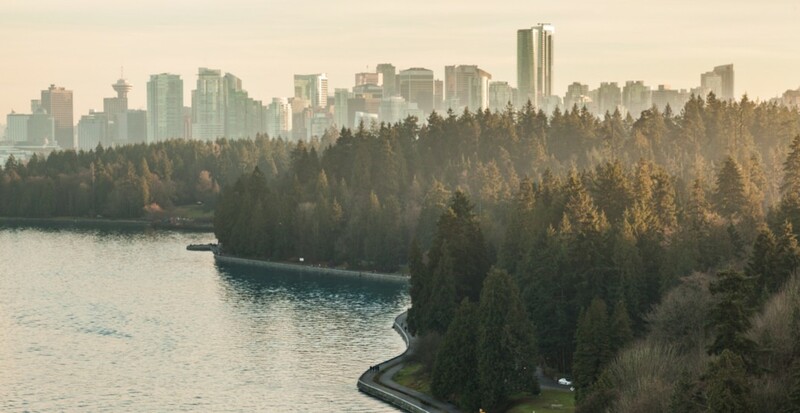 But Vancouver’s low standing is also a matter of its small land area, which arguably makes it an unfair comparison with cities with a significantly larger geographical size. Vancouver city proper is just 115 sq. kms. — less than one-sixth of the City of Toronto and slightly over one-seventh of the City of Calgary. When the entire region as a whole is compared, Metro Vancouver’s ranking fairs far better with 90 skyscrapers, giving the region a 45th spot in the world — just behind Makati, Philippines and just ahead of Nanjing, China. 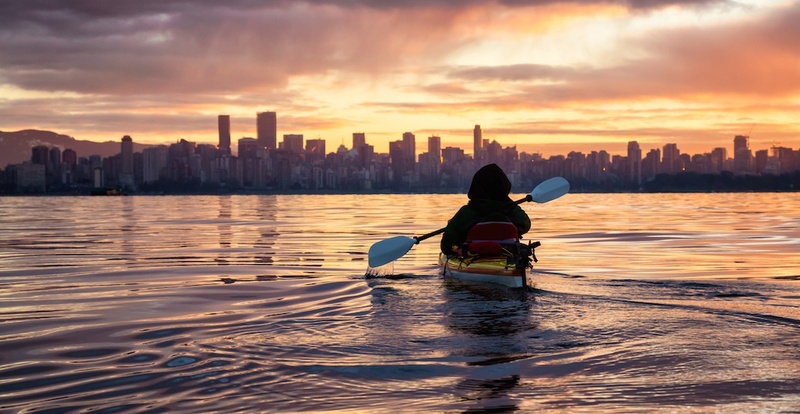 The region’s suburban municipalities — specifically Burnaby, Coquitlam, New Westminster, and Surrey — are increasingly home to a greater share of Metro Vancouver’s tallest buildings. In fact, an upcoming skyscraper over 213 metres (700 ft) adjacent to SkyTrain’s Gilmore Station in Burnaby will topple Living Shangri-La’s title as the tallest building in the entire region. Three other nearby towers at The Amazing Brentwood redevelopment and another future tower in Surrey will completely overhaul the ranking of the region’s tallest towers. However, given its overall population density, the City of Vancouver scores favourably on a per capita basis; there is one skyscraper for every 11,053 people in Vancouver, 9,293 people in Toronto, 18,772 people in Calgary, 38,750 people in Montreal, and 12,078 people in Seattle. Our tiny region: Is geography a factor in Vancouver's affordability crisis?